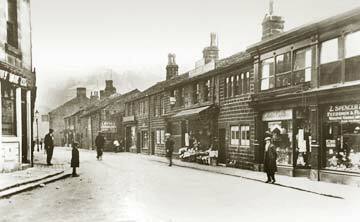 Bridge Gate, Hebden Bridge, around 1900. Even then William Holt (centre) was making a splash with a tempting display of goods to entice the customers! Reproduced by kind permission of Calderdale Metropolitan Borough Council - Shibden Hall. William Holt, Greengrocer and Fishmonger, has been a landmark at Bridge Gate, Hebden Bridge for nearly 75 years. But the story of this venerable retailer goes back long before that - to the Victorian Age when Holt's was based in Market Street. Around the turn of the last century William Holt moved to Bridge Gate. Following a road-widening scheme in 1931, in which the two end properties were demolished, Holt's moved two doors down to number six where the business has remained ever since. Carrying on a retailing tradition which still prides itself on good, old-fashioned service to the customer and quality produce, William Holt has now been taken over by Bob and Maria Cowling who returned to the valley four years ago to run First Choice in Mytholmroyd. The couple aim to maintain William Holt's reputation as the town's premier greengrocer and fishmonger specialising in first class fresh foods whilst expanding the selection of organic produce. An unbeatable blend of Victorian and 21st century excellence!